Ten treacherous, worn steps led from the quiet Camden backstreet down into the damp gloom of Rose Porter’s basement flat. Decades of garbage lay packed in the stairwell, the acrid stench of a thousand Friday nights’ piss hanging in the fetid dark pit. Visitors were rare these days; a reluctant social worker with little English, a charity volunteer maybe, but few others ventured down to rap the rusting cats’ paw knocker that hung by a single nail from the peeling old door. They needed to be patient though, seconds turning to minutes as bent fingers fumbled to free the reluctant bolts within. Rosemary Eleanor Porter had been a frail yet talented only child, a sickly loner with a natural gift for music. The family was poor by any standard, her father toiling long hours as a solicitor’s clerk while her mother cleaned and cooked for the grand houses on Thaxton Drive. For years her mother dropped every spare penny into the cracked jug on the mantelpiece, ‘Rose’s music money’ she called it, longing for the day when her child might have the opportunity that her own wretched upbringing had denied. Rose would remember her ninth birthday forever. She had stood in the street, oblivious to the wind and the rain and watched with open mouth as a swarthy gang of men manoeuvred the big old upright from the butcher’s van, down the narrow stone steps and finally, sweating and cursing, into the front room. And how she loved that piano, her piano, not even noticing the beer glass rings and the fag burns, the profanities scored down the scuffed legs. Her parents had found a local music teacher, a retired librarian who took to the little girl immediately and for a modest fee, gently coached and nurtured the little girl twice a week and well into her teens. She practised at home constantly and, by the age of fourteen, Rose had achieved her Grade 8 and she too had begun giving tuition to local girls, many of them older, the daughters of her mother’s well-heeled employers. Often they’d giggle when they first saw the state of the old instrument and, she would later learn, make cruel comments to their friends. But as Rosemary Porter grew into a mature, calm young woman, her reputation as a patient and generous tutor spread across the affluent areas of town. Several nights a week, a steady stream of Jaguars and Rovers would drop off their Annabelles and Anastasias for their lessons. If she bore resentment for their wealth and their privilege, she didn’t show it. For her, the pleasure of watching her young musicians begin to share her love of Haydn and Debussy, in return for a small payment, was handsome reward. 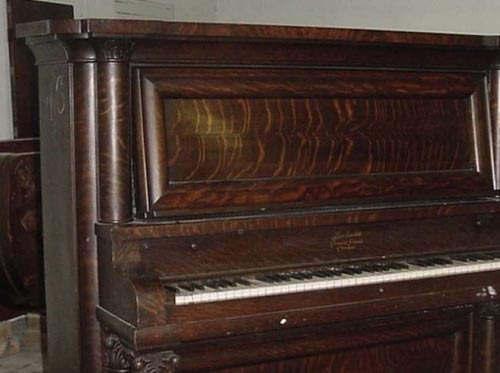 Week by week she saved the fees and, by now seventeen, could finally afford a fine new piano whose light keys and bright, sparkling tone brought out the very best in her young, always female, pupils. ‘Girls really listen’ she’d tell her mother. But Rosemary’s world was to suffer a blow so terrible that it shaped – and ruined – the rest of her life. One wild, wet November night as her parents hurried across the unlit street to the flat, her father’s umbrella shielding them from the downpour, a large black saloon careered into them, killing them both instantly. The driver, running late, was on his way to collect his daughter from her piano lesson. For months Rosemary spoke to no-one, refusing even visits from the few distant aunts and uncles who tried so hard to console her. She resolved to stay in the little basement flat, creeping out under cover of dark to buy her few essentials, avoiding contact or conversation. Time perhaps can heal and, in Rosemary’s case, it seemed that after about a year she had started to leave the flat some mornings for a walk in the park, or to browse the library. She began responding to greetings from neighbours, peering into prams to compliment proud mothers, feeding the squirrels with breadcrumbs by the swings. Sometimes, she even smiled. Her recovery took an even more positive twist when she put an ad in the local newsagent’s window offering ‘Piano lessons for girls aged 8-14’. The result was overwhelming and within days local parents were once again bringing their daughters to the young woman with the kind nature. Whether from pity or guilt, they came in their dozens but Rose catered for them all, often fitting in six or seven lessons every day of the week. Neighbours would joke about living in ‘millionaires’’ row’, from the fabulous cars which parked and waited outside the steps to number 11a. Her income meant that she had no need for other employment and, apart from a few hours a week helping sort clothes at a nearby charity shop, music remained at the centre of her life. She had few friends, certainly none whom she might have called ‘close’ and even by her thirties, apart from her beloved father, had never felt a man’s kiss. There was a man, once, briefly. Anthony. He used to collect donations for the charity shop and always smiled at her with a warmth that Rose had started to enjoy. He brought her flowers one Tuesday, Carnations with a red ribbon. And the following week, chocolates. One day he asked if she’d like to go for a walk in the park the following Sunday, perhaps have a pot of tea and a scone at the café by the lake. She’d been taken aback by the offer, pleased yet unsure of how she ought to respond. But she agreed and spent the rest of the week fretting over the appointment and what they might talk about. It was raining that Sunday, sleet almost. She was early and sheltered under the eaves of the café. Fifteen minutes, thirty, an hour. He didn’t come and finally, she walked slowly home, drenched and sad. She never worked at the charity shop again and, months later, overheard someone say that he’d married a young singer and moved away. Rosemary Porter carried on giving piano lessons to her young pupils for another four or five years, gradually cutting back the numbers until, approaching forty, she finally stopped. She felt empty, drained of all enthusiasm and spirit, her life now simply an existence. She withdrew from society, the very fabric of the Victorian basement flat crumbling around her through the next thirty five years, her only companions the scrawny cats she welcomed in for milk and bread. And now here we are, in Rosemary Porter’s tiny sitting room. She is standing by the mantelpiece, a sepia photo of her parents on their wedding day rests against an old cracked jug. In the fireplace glows a single bar, her only heat. She shuffles across the lino, stumbling briefly as a slipper catches on the torn rug edge, reaches the piano and lifts the keylid. She stretches the fingers of her right hand to form a chord and the sudden shot of pain straightens her back. It’s too much. She stops, watery blue eyes gazing down at the once supple artist’s hands, before moving slowly away. Now she’s fiddling with the folds of the moth-eaten curtains, oblivious to the cat mess she’s standing in. Something on the far wall has attracted her, she’s over there now, leaning forward to look at some framed photos. There are seven of them, in identical mahogany frames, each of a young girl with plaits or bunches, smiling, each proudly clutching a certificate. And in the left corner of each picture is a small, white card carrying a handwritten note of the girl’s name, age and where Rose had buried her.